Lehman College has more than 12,000 students and 60,000 alumni and also serves the Bronx and the surrounding region as an intellectual, economic, and cultural center. We wanted to create a platform where students, faculty and staff could access, upload and share a range of creative and informative videos to enhance learning. As part of this we are building a video library, called Digital Connect, for students to access content anytime, anywhere, and on any device. Everyone uses videos as a resource and the success of YouTube is a true testament to this. If you want to see how something works, ‘YouTube it' and chances are, someone has made a video about it. Imagine using video as a channel for students to access their lectures. These videos can really help students revise for exams, or those who have missed a class due to work commitments or use English as a second language. Watching a lecture more than once provides a greater learning experience. We had a lot of video content stored in various locations, such as YouTube, Vimeo and Blackboard making it difficult to search for content. Variations in the way that videos were catalogued added to this management issue. The first step was to identify an easy-to-use video platform solution that the IT department could utilize to catalogue and store high definition videos in one centralized location. All videos produced on the college campus are created in high definition and it was important that there was no loss in quality when the content was uploaded. The college prides itself on the quality of its video content and so it was important that this was also reflected in the Digital Connect library for students and faculty. Lehman is becoming increasingly known for its $16 million Multimedia Center that is used by organisations outside the college, including the public access television channel BronxNet. It was important to catalogue files in a way that made them easy to locate when a student used the search function. Strict guidelines regarding tagging videos were important as was automating the process to encourage lecturers across the college to proactively add their videos and other presentations to the library. We selected MediaCore as the solution that best met the requirements for the Digital Connect video library. The first step was to locate all of the college’s videos both online and offline. The process took about 6 months initially but it is still ongoing. Once completed, each video had to be catalogued using the specific tagging guidelines to enable users to readily locate content. The MediaCore platform used for Digital Connect was ideal when it came to uploading high definition videos. Previously, we had to compress files individually before uploading them and this sometimes compromised the quality. Broadcast quality videos up to 20GB can be hosted on the new site. The biggest and most important part of the implementation was the single secure sign-on capability. This means that a student can use their same credentials for college email to sign into Digital Connect. This helps to encourage usage, avoids confusion with passwords and is easier for the IT department to manage. Digital Connect has made it easy for students and faculty to access videos. We needed to make things easier to manage. It saves more time as more people use it and we wanted more space for video content and the MediaCore platform was able to provide this. Everything is quick and easy now. 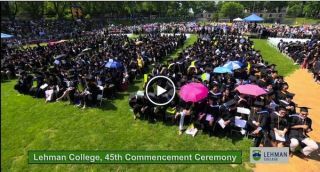 Especially the uploading of content such as the commencement video, which is time-sensitive and needed to be uploaded the next day. Content can be uploaded onto Digital Connect in a private folder called the Collection and once cleared it can be posted live at a push of a button. Access management is also covered enabling lecturers to limit certain content to specific groups of students only. MediaCore is a fantastic platform for video-based learning and there has been very positive feedback from both students and faculty alike. It’s great that our students now have access to this content whenever and wherever they are. The college also plans to host PDFs as associated files in addition to audio files, podcasts and photography on Digital Connect. Lehman has seven distinguished professors including Billy Collins, Poet Laureate of the United States and New York State Poet Laureate and composer John Corigliano, winner of both the Academy Award and the Pulitzer Prize for Music. The videos and podcasts presented by these distinguished academics is a key differentiator for Lehman and the process of uploading and sharing them is much easier with MediaCore. Brendan McGibney is the Technical Director at Lehman College in New York City.